Gwinas is a Bosmer noble staying at The Tiber Septim Hotel in the Imperial City's Talos Plaza District. He has a profound interest in the Commentaries on the Mysterium Xarxes. He has traveled all the way from Valenwood, in search of the four rare books. 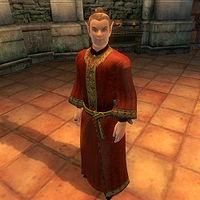 You will encounter him when you reach the related quest's stage 40, where he will be the book collector that has the third volume of The Mythic Dawn Commentaries on special order in the First Edition bookstore. He will make his appearance in the bookstore (and in the game) the moment you have spoken to the owner, Phintias. After you have convinced him to hand over the book, he will go back to the hotel and stay there. He will sleep in his room every night between 10pm and 6am, and then wander around the hotel lobby all day long, only interrupted by his breakfast between 8am and 10am and dinner between 6pm and 8pm, both of which he will take seated in one of the chairs in the lobby. He wields a steel dagger and wears a pair of gold trimmed shoes along with the rare red silk robes. He's also in possession of a random piece of jewelry, a note, and a considerable amount of gold. Esta página foi modificada pela última vez à(s) 05h45min de 19 de outubro de 2015.